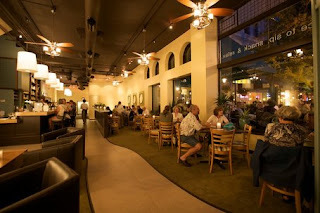 This is going to be a long and detailed post but let me give you the gist right in the beginning: my meals at Posana Cafe were the best I've had since being diagnosed with Celiac Disease in June 2005. I don't make that statement lightly; you regular readers know that I do my fair share of eating in various cities and have had the opportunity to eat in enough gluten free restaurants to have a depth of experience with which I can compare Posana. Now for the lengthy writeup. My sister had heard that Posana was entirely gluten free but after checking the restaurant's website and menu I remained skeptical. I couldn't find a mention of the restaurant's gluten free status. We stopped in the night before our reservation to verify that the restaurant was gluten free and we were told that the entire restaurant is gluten free, save for the beers on tap. They do, however, have an excellent selection of gluten free beers (more on that later). I made sure to prepare for Posana by going on a long, mid-afternoon run and eating lightly thereafter; I wanted to make sure I was ready to devour as much food as possible in what would hopefully be a great gluten free restaurant. I was not disappointed. After being promptly seated after our 7:30pm reservation time, I practically started to salivate at the table. The menu was varied and included a great selection of pasta dishes -- even gnocchi! I can't remember the last time I had gnocchi; I wasn't a large fan before my Celiac diagnosis and obviously couldn't eat it after being diagnosed. I was excited to rediscover the food after having it withheld from me for 6 painful years and decided to order the gnocchi. My sister requested the vegetarian pasta and my parents ordered the trout after being convinced by my sister that they could not leave Asheville without having tried trout. I also ordered the Vietnamese Spring Rolls as an appetizer. The Spring Rolls were served with a delicious ponzu sauce and were very good. They may not be the most unique gluten free item, but the ponzu sauce is something I typically stay away from so I was happy to be able to indulge. My mother's order of that night's salad special, featuring watercress, raspberries, a raspberry dressing, and candied pecans, was likewise terrific. I should also mention that I had a Green's gluten free beer and it completely blew Redbridge out of the water. I'll have an alcohol-themed Asheville post in a few days, as the city had a lot of great alcohol options for gluten free people. When our main dishes arrived, I was initially breathless. Sitting in front of me was a huge bowl of gluten free gnocchi. I was admittedly nervous about digging in to the bowl in case it was bad; my hopes at that point were pretty high. I gingerly moved the gnocchi around in its bowl and skewered one with my fork. The fork was weighed down by six years of anticipation -- could I have finally found an amazing, totally gluten free restaurant with meals that could masquerade as gluten filled? I ate my first gnocchi and it was love at first bite. Wow. It was thick like gnocchi should be and perfectly flavored with a lemon-flavored sauce. It was filling, it was bursting with flavor, it was, in a word, spectacular. I barely set my fork down until I had devoured the entire bowl of gnocchi. I did take a picture (see right) and I apologize for it not being a better picture. I promise once I get the new iPhone to be on my game. My sister's vegetarian lasagna was great too, however I preferred the gnocchi. My parents' trout was terrific and came with a delicious side of beans. Now, while you may think I was full after that amazing gnocchi, you would definitely be mistaken. I was on a tear at Posana because I had no idea when I would next be able to visit an entirely gluten free restaurant. In that spirit, my sister and I aimed to order gluten free desserts that were unique and that we wouldn't likely find as a gluten free option elsewhere. I ordered the Chocolate Hazelnut Crepes while my sister went with the Roasted Sweet Potato Cheesecake. I enjoyed the Crepes, but the Cheesecake was a revelation. It had a great cinnamon kick to it and was absolutely delicious. It was exactly the unique dish we were looking for instead of another flourless chocolate cake. To see a menu with such a wide variety of options for gluten free folk was absolutely amazing. My mother ordered the North Carolina Apple: Three Ways and, while we enjoyed it, the clear winner was the Roasted Sweet Potato Cheesecake. When the meal was finally over, I was pleasantly stuffed with food and happiness. During the meal we were also treated to a discussion with the chef, who told me that he started cooking gluten free because his wife and kids have Celiac Disease. He regaled us with one anecdote in which his wife enjoyed some gluten free pretzels and suggested that he try them; after trying them, he practically spat them out with distaste. He decided to try and make a great gluten free product that would taste like gluten filled products. You gluten free folk know how difficult this is, but Posana has achieved this with remarkable success. He also told us that to make many of the products he uses Bob's Red Mill's products but makes his own mixes using Bob's Red Mill. To reiterate my sentiment from above: this was the best meal I have had since being diagnosed with Celiac Disease in June 2005. I've been fortunate to eat at "fancier" restaurants, but nothing can beat having the ability to choose from an entire gluten free menu. While some restaurants do have dedicated gluten free menus, they are often in addition to the "regular" menu. To go to a restaurant serving a menu that is gluten free and "regular" was an unbelievable treat and was made so much better by the food being great. If you are anywhere in the Asheville area, even as far away as Charlotte (about a two hour drive), I urge you to check out Posana. In over 2.5 years of blogging and 6 years of having Celiac, I have yet to find a comparable gluten free dining experience. I'll be back soon with a post about the restaurant's breakfast options because yes, I did visit the restaurant twice within a 12 hour period... don't judge me because I do it all for you, faithful readers. Go ahead, lick the plate.